The main dish of a meal in Macedonia can be various and can be with or without meat, can be fasting, cooked, stewed, baked, fried and grilled... We have created the perfect food for each of the seasons, holidays and even food for a particular day of the week. At the end we Macedonians often end up cooking for more people than we invited for lunch in the first place, just in case, so our table is full and colourfull. 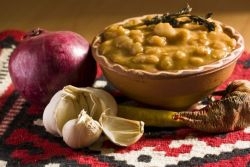 Tavche Gravche is one of the most popular Macedonian meals and is prepared in two main ways baked and cooked/stewed beans. Flavoured with fresh peppers, garlic, onions and other spices it gives the true taste of Macedonian cuisine. Many times meat is added as it enhances the flavour, most popular are home made sausages, pork ribs and bacon. It goes without saying that grandma's tavche gravche is the best and each one makes it in her own special way, and Friday is the day most families have tavche gravche as a meal. Sarma and Dolma are ones of the many dishes that have an oriental heritage and have been introduced into the Macedonian cuisine during the many years of Ottoman rule. They are one of the favourite home cooked meals and hardly a week goes by without them being prepared. 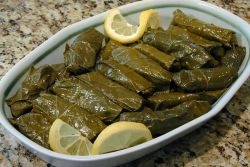 Sarma consists of rice, minced meat and spices wrapped in a cabbage or a special tree leaf (pictured) and Dolma is the same ingredients stuffed in peppers. Sarma and Dolma can also be without meat during the fasting periods for Christmas and Easter for which they are traditionally served. Ohrid Trout is the best Macedonian fish meal you can eat. 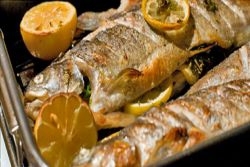 Ohrid trout is the iconic fish of Lake Ohrid and the nearby restaurants specialize in preparing it in various ways. Though the prices are quite high for local standards, the delicacies will leave you wanting for more. 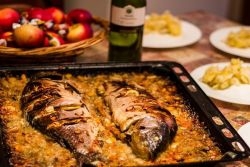 Carp is another fish that is found in abundance in the Macedonian lakes and rivers and besides being a popular fishing catch it's also popular on the menu, especially in the Dojran area where the Dojran Carp is a delicacy. The Carp is prepared in several ways and is best served fresh, so make sure wherever you go to, always ask for a fresh and wild carp. Selsko Meso (loosely translates to Village Style Meat) is a delicacy prepared with pork meat, spices, onions, garlic, peppers, tomatoes and is usually firstly stewed and then baked in a traditional clay pot. The seasonings make it highly customizable as to satisfy the tastes of everyone but one can also add some dried red peppers for that hot spicy taste. Musaka is also an oriental dish that is prepared from baked potatos, minced meat, eggs, spices and other seasonings depending on desire. 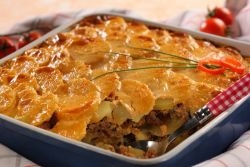 Musaka is served at most traditional restaurants and is easy to try and make yourself duing the stay in Macedonia. Kebaps and Pleskavica (Kebab and Burger) are the most famous choices when it comes to grilled meat. Although they are basically the same meat they are prepared differently. Kebaps (pictured left) are small, bite size packed minced meat with garlic and different spices and are served with bread, tomatoes and onions and french fries. The pleskavica is a burger minced meat and can be prepared in a number of ways and it can be filled with melted cheese, kajmak (a traditional Macedonian supplement which is highly recommended), bacon and is served with a hot pepper, onions and french fries. These two dishes are offered by most restaurants in the country. 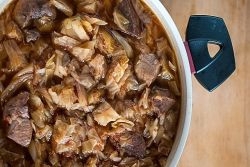 Cabbage Stew with Pork Meat is a traditional Macedonian meal with the name pretty self explanatory. 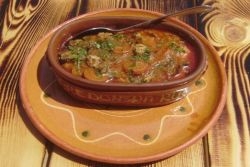 It consists of stewed cabbage together with pork meat and added spices. It is considered a healthy meal despite the pork meat and when served usually lemon juice and dried hot peppers are added.